At Big Thunder Events, we specialize in " Hands-Free" event planning. Our event specialists will meet with you to learn what you would like to see at your event, then we will plan every detail from beginning to the final clean up so you can can relax and enjoy along side your guests. In other words, we do all of the leg work and you recieve all of the credit. We offer some of the most "mind-Blowing" inflatable equipment on the market as well as games, tents, tables, chairs, concessions, sound and the greatest staff available. You will be amazed by how smoothly your next event will operate. Big Thunder Events will take the "stress" of planning your next company picnic, school or church event, festival, fair, post prom, lock in or any other reason to gather with friends so you can enjoy. "Do you just want to entertain them, or do you want to take them by STORM ?" 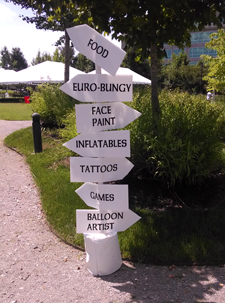 Not sure what type of corporate event to throw? Here are some ideas that will build your brand, as well.